Welcome aboard your ride, 27-ft. Merimac complete with an enclosed washroom. 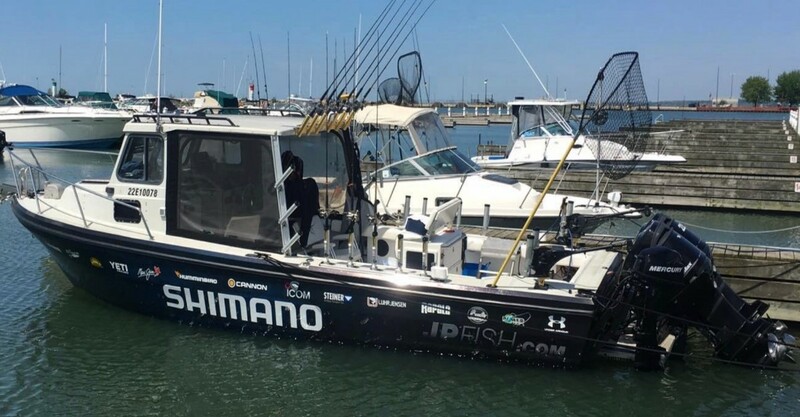 It's the safest and fastest boat on the north shore complete with twin 225 Mercury Outboards. 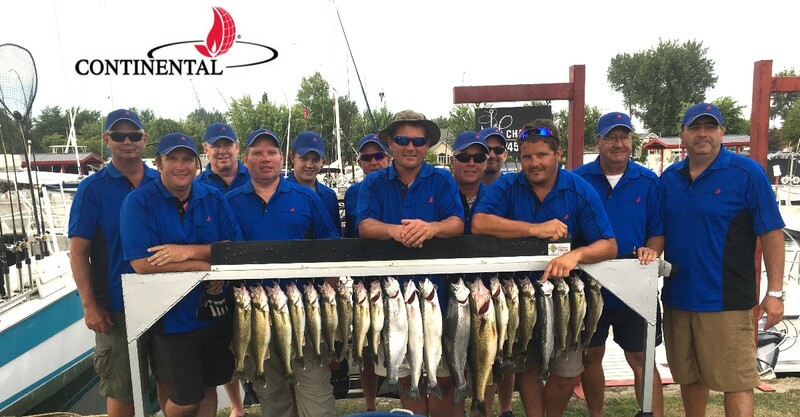 We can accommodate large groups For Corporate Fishing Charters of any Size ! Please call 519-897-1042. 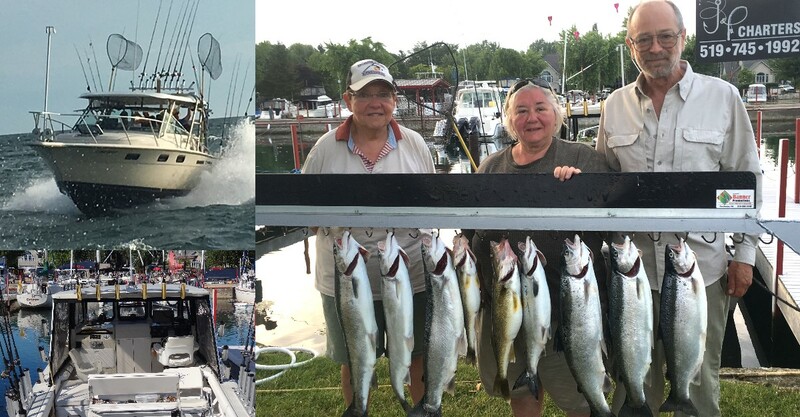 Spectacular day on Lake Erie with non stop action. 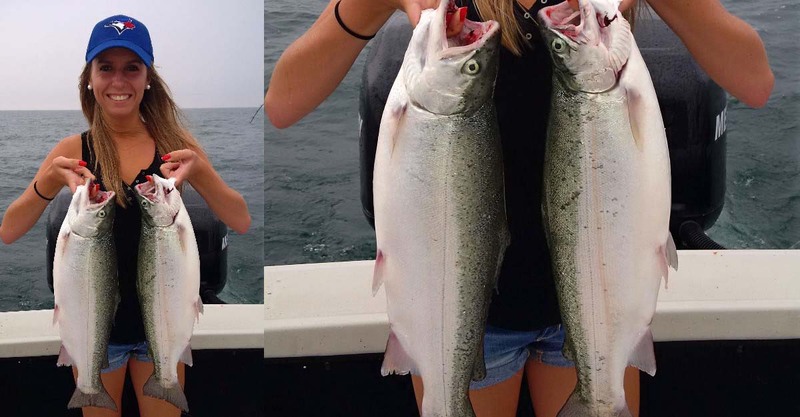 This young lady put on a clinic and made it look easy as she shows off whats on the menu. Capt. Paul and Sandra. 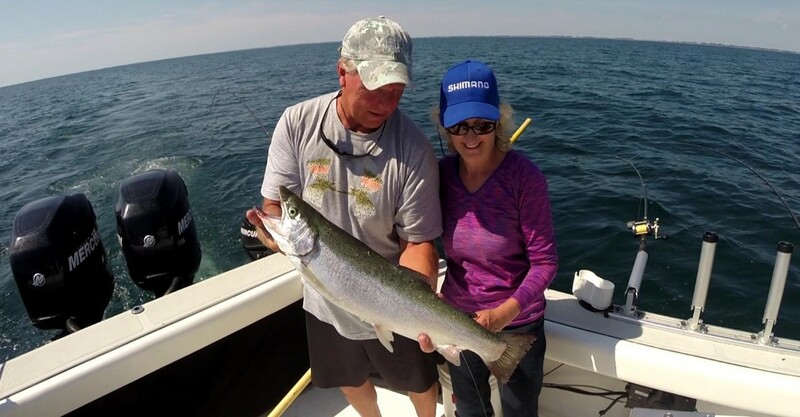 SANDRA'S TESTIMONIAL: It was an easy drive from Toronto, Erieau is beautiful, Paul recommended great accomodations, It was exciting when this fish jumped twice and I landed my personal best 8 pound Rainbow Trout. Thanks Paul. 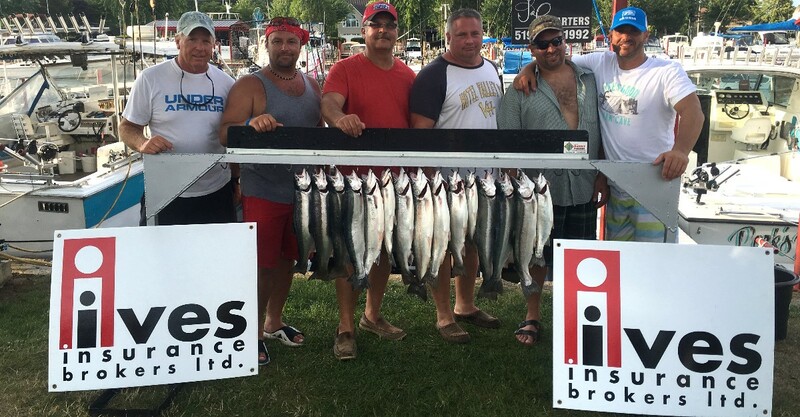 Another Great Day with Paul Powis in Erieau Ontario. 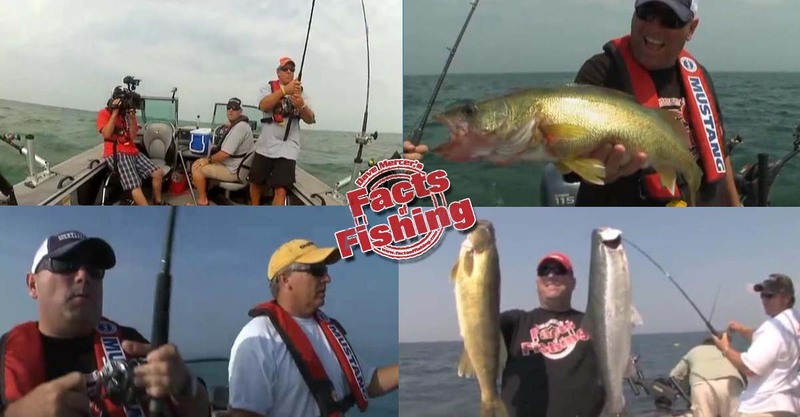 Dave Mercer-Professional Angler/TV Fishing Host of his own show THE FACTS OF FISHING. Paul has guided for him on a number of shows. 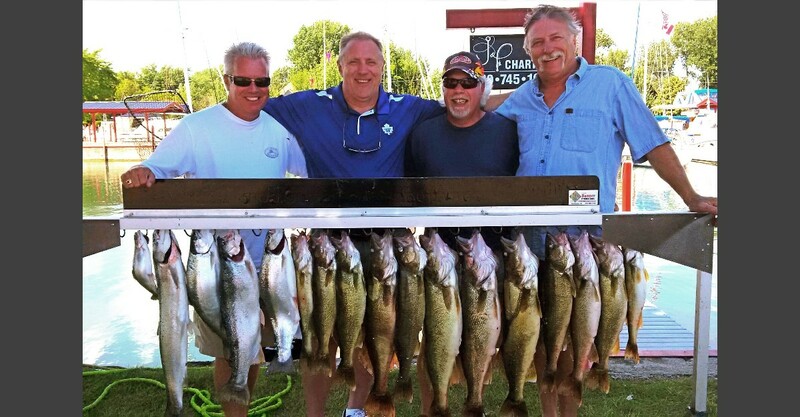 Big smiles go with the big fish. 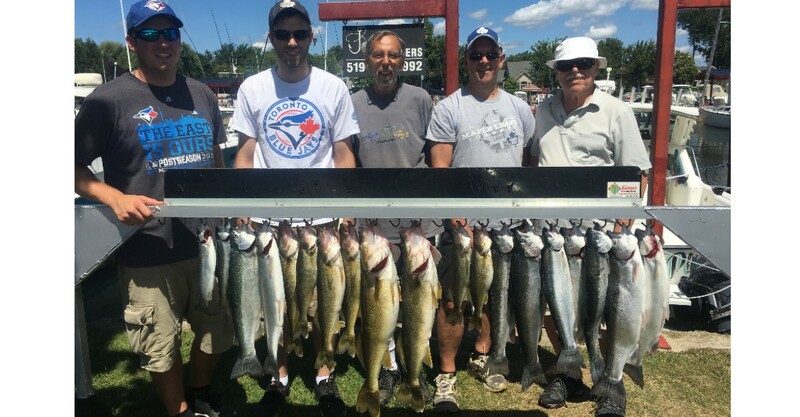 They had a blast and found out how great the Ontario fishing is on Lake Erie. 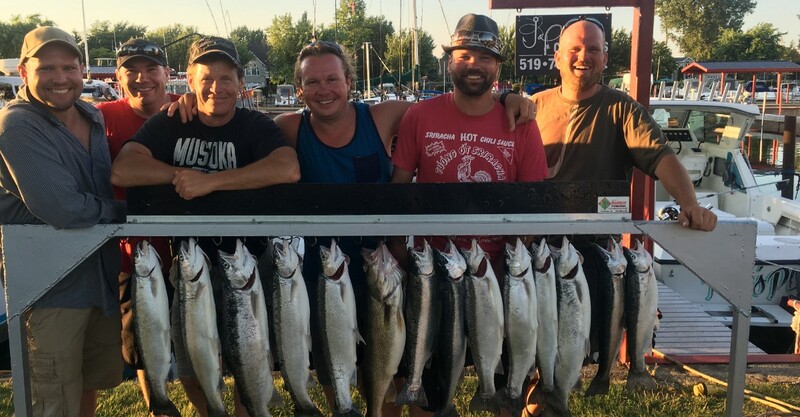 This fun bunch of guys had an amazing day on the water. 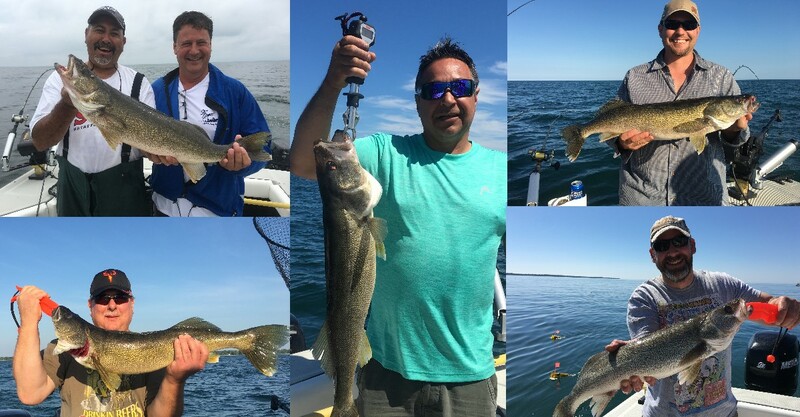 More fun on Lake Erie as the bite was on. 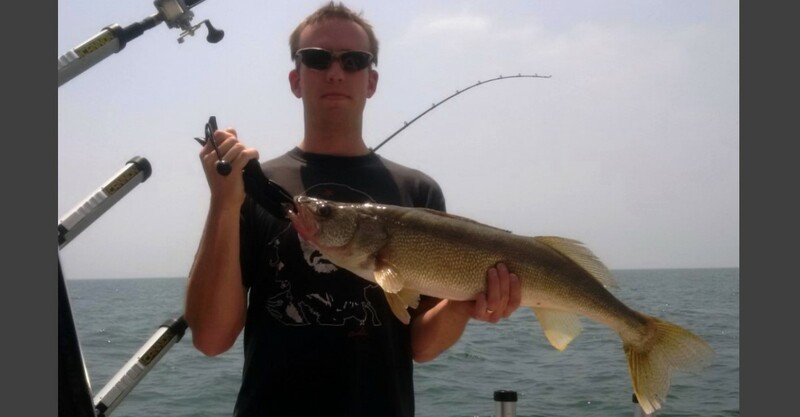 Picture perfect keeper Walleye. 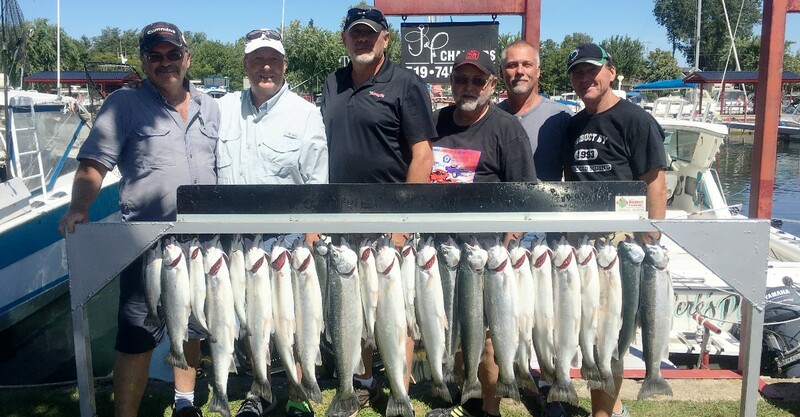 Book early as we fill up our calendar very quickly. 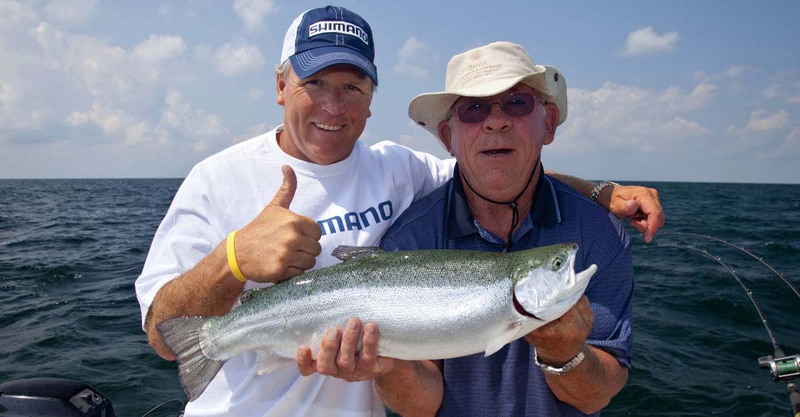 Paul salutes the fine effort of landing this hard fighting Rainbow Trout. 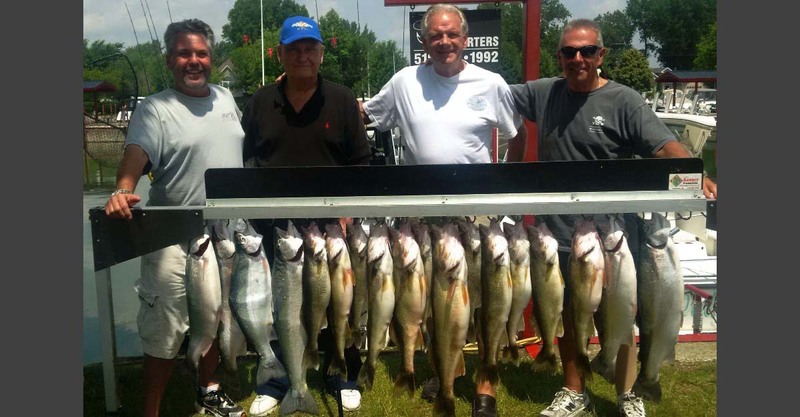 Great Anglers enjoying amazing August fishing on Lake Erie. 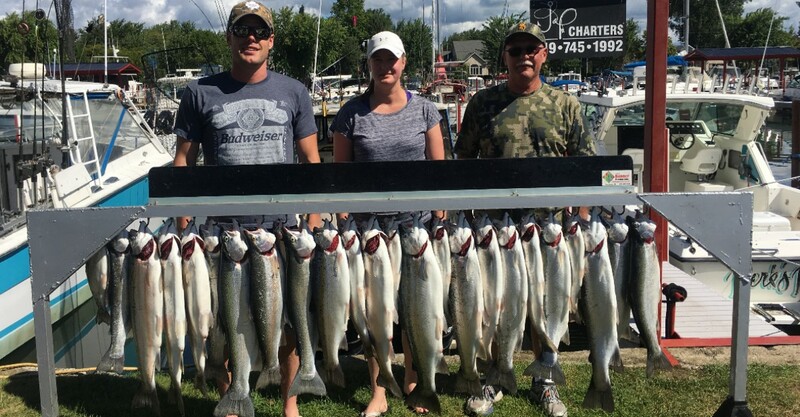 Hard fighting fishing on Lake Erie in August 2016. 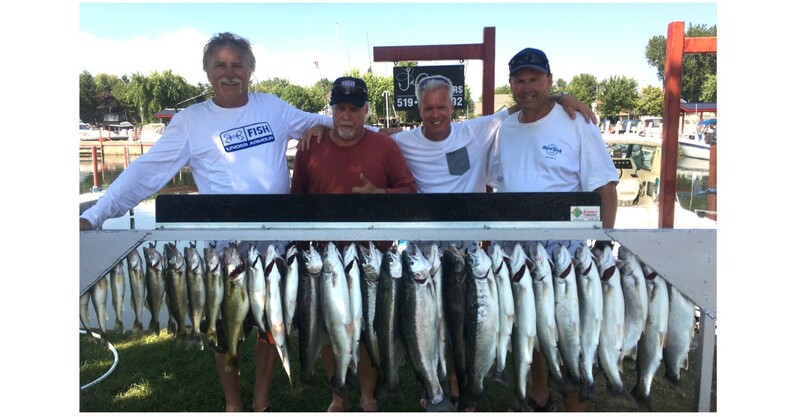 WOW what a fishing trip, as they loaded up their catch and equipment they gave a big thank you to Captain Paul and said "We'll Be Back". 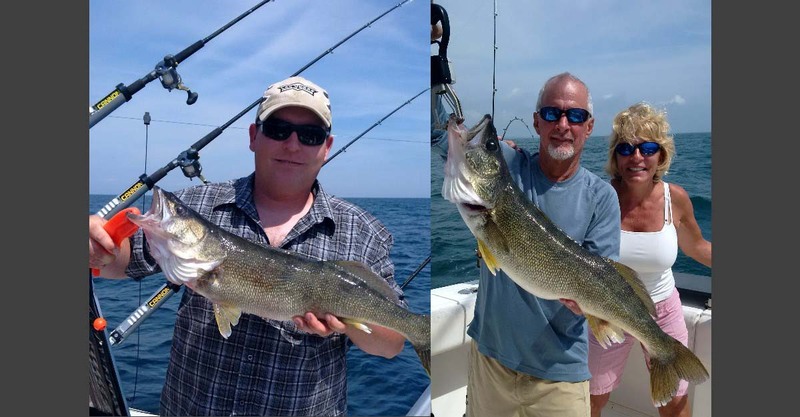 Both Walleye and Rainbow Trout on the menu tonight. 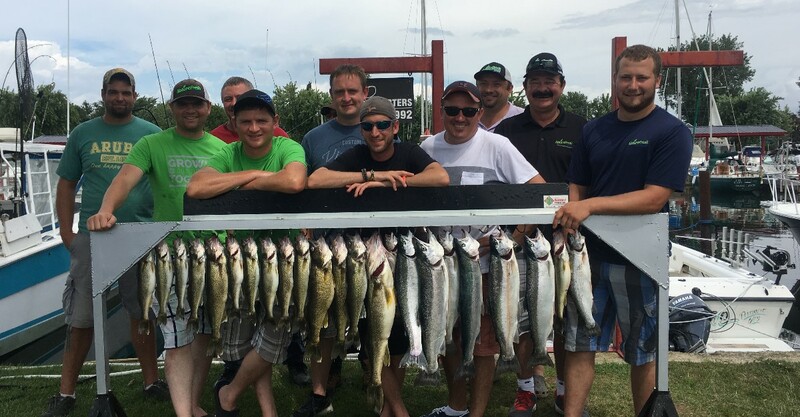 The Boys captilized once again with both Walleye and Rainbow Trout making it into the cooler. 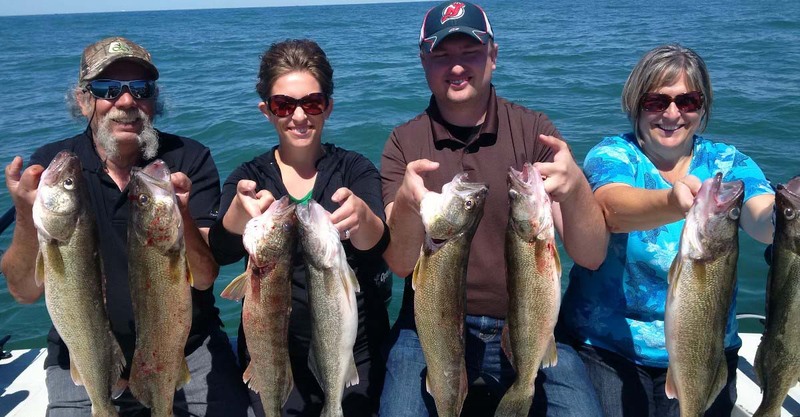 There is a couple of trophy walleye on this rack. 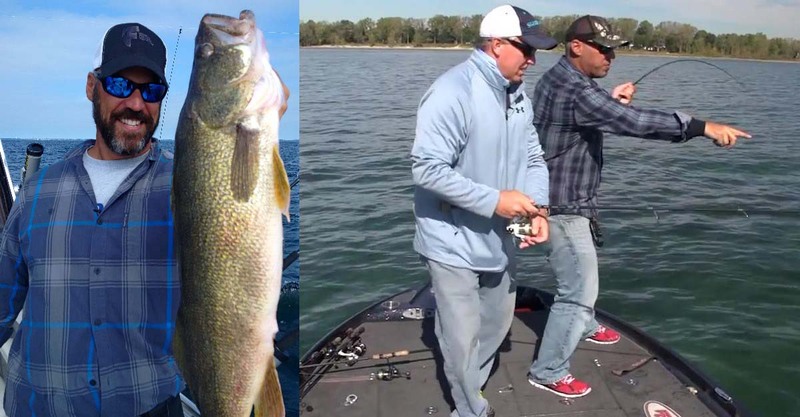 Memories forever, very nice Walleye and great team work! 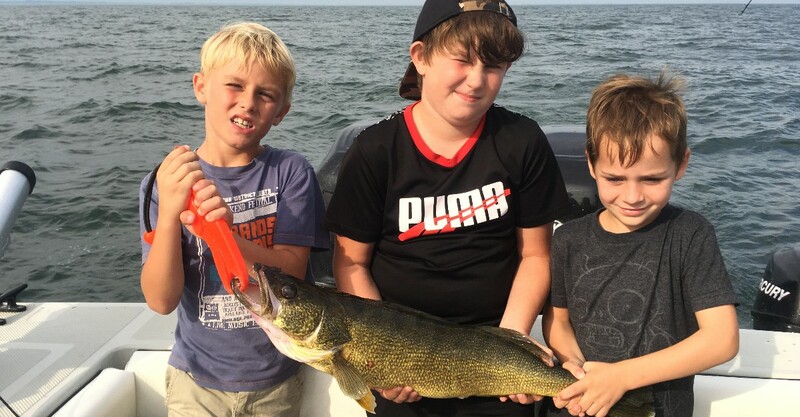 It was a great day on Lake Erie with the kids getting to see some trophy Walleye landed. 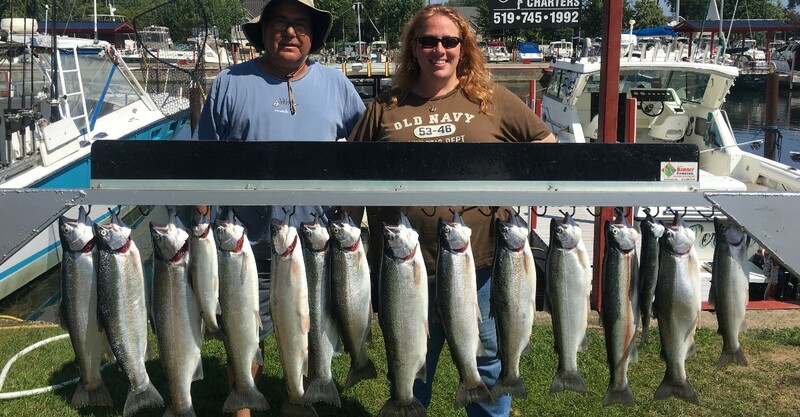 A perfect day on Lake Erie with this nice split of Walleye & Rainbow Trout. 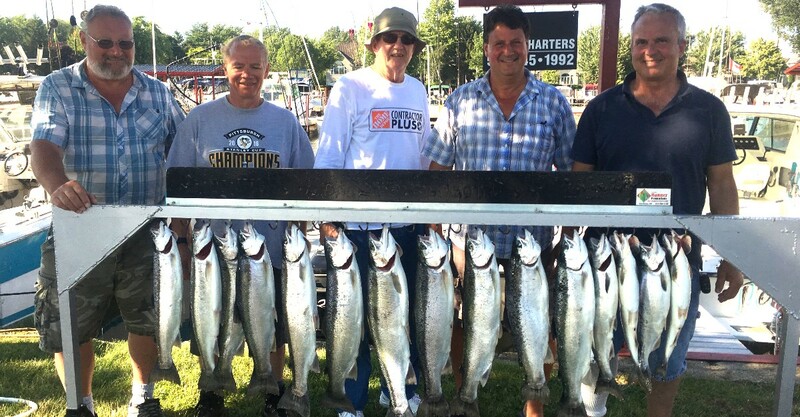 Some hard fighting Rainbow Trout were no match for these seasoned anglers on Lake Erie today. 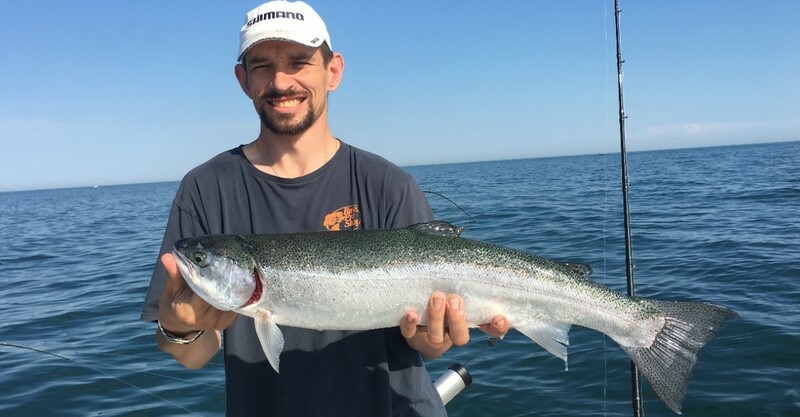 Great angling skills with the Shimano Rod & Reel resulted in this photo of a large Lake Erie Rainbow. 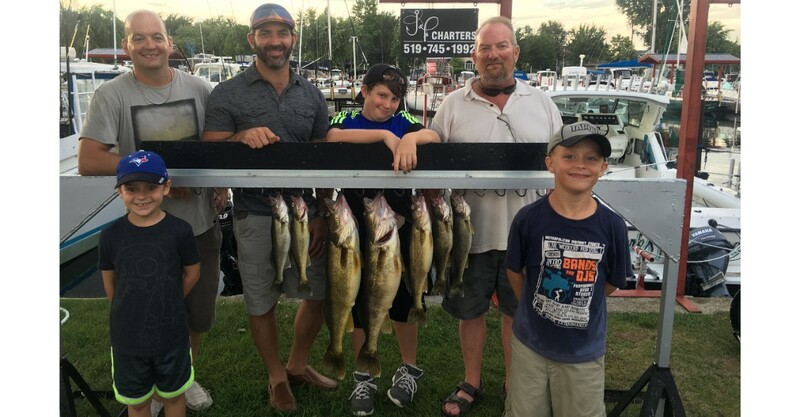 Fishing Report... Lots of smiles and Walleye. Do you have questions, need quick answers, need available dates ? Please do not hesitate to ask questions by text, cell or email. 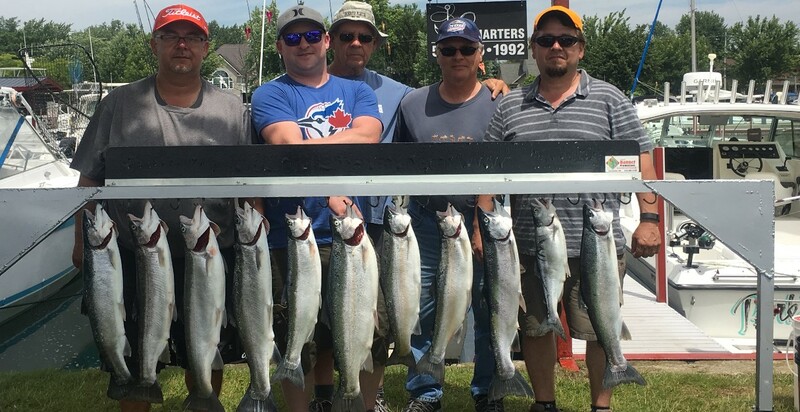 It's going to be another great fishing season. Hope to see you soon.